We would like to say a big thank you to everyone who joined us on the Tate-Khan platform and contributed to the Big Question debate on the importance of Art. Here we republish the word cloud of conversations that took place, but we encourage you to read a wonderful summary by Camille, Tate community moderator. The Big Question event was international, inspiring and busy. We had participants joining us from all over the world sharing thoughts on the importance of art on many different levels – personal, social, cultural and political. It ran for a couple of weeks in May. 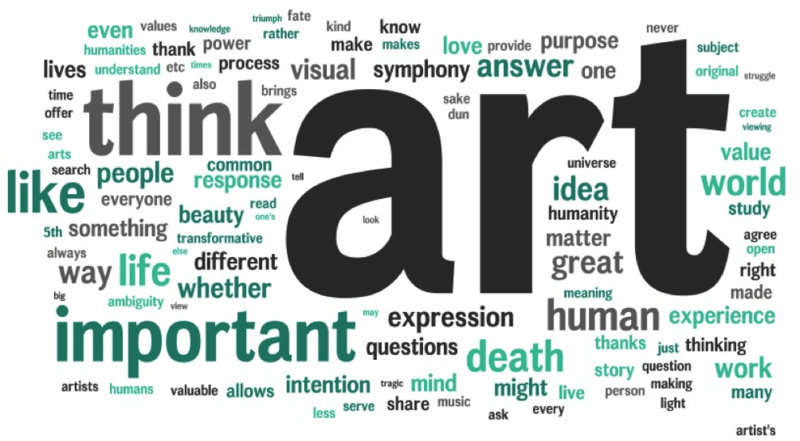 The Big Question discussion on ‘Why is art important?’ is open, continuos and ever-growing. And it is only a fraction of what Tate on Khan offers to all art lovers worldwide.